It is proposed that happiness be classified as a psychiatric disorder and be included in future editions of the major diagnostic manuals under the new name: major affective disorder, pleasant type. In a review of the relevant literature it is shown that happiness is statistically abnormal, consists of a discrete cluster of symptoms, is associated with a range of cognitive abnormalities, and probably reflects the abnormal functioning of the central nervous system. One possible objection to this proposal remains--that happiness is not negatively valued. However, this objection is dismissed as scientifically irrelevant. It revealed that Britain had the highest net household income - £35,730 a year it is 10,000 pounds above the European norm - but much of this is spent on a higher cost of living. Britain is also near the bottom of the rankings when it comes to health and education spending as a proportion of gross domestic product (GDP), has a below average life expectancy - and enjoys far less sunshine. And it's only going to get worse when spending cuts kick in. The best quality of life, meanwhile, is right across the Channel, in France. The Economist Intelligence Unit has published its annual list of the world's most liveable cities (presumably behind a billgate somewhere); the top 3 are Vancouver (again), Vienna and Melbourne. London failed to make the top 50, appearing at #51, having been beaten by Manchester at #46. Australia, New Zealand and Canada all did well; Toronto was #4, and Sydney, Adelaide, Perth and Brisbane are all in the top 20; the US's most liveable city is apparently Pittsburgh, at #29. The least livable city this year is Harare, in Zimbabwe, though it's not clear whether other candidates (such as, say, Mogadishu or Pyongyang) managed to beat it, or didn't even make the chart. An Europe-wide study has shown that, of all the countries in Europe, Britain has the lowest levels of "trust and belonging" amongst under-50s. Generally speaking, would you say that most people can be trusted, or that you can't be too careful in dealing with people? Do you think that most people would try to take advantage of you if they got the chance, or would they try to be fair? Would you say that most of the time people try to be helpful or that they are mostly looking out for themselves? The researchers suggest that our low "trust and belonging" score may be "the result of the development of a highly individualistic culture in the UK". Basically, the suggestion is that we are in danger of becoming the most selfish nation in Europe. That's one explanation, that the low level of trust is symptomatic of Thatcherite-Blairite Hobbesian anglocapitalist values, where man is expected to be wolf to man (after all, were this not the case, that would be grossly inefficient and uncompetitive). Other factors could include greater geographical mobility (a society of immigrants, expatriates and the global superrich would be less cohesive than a tightly-knit local society). Interestingly enough, the countries with the highest level of trust and belonging in Europe appear to be Denmark and Norway (Sweden, it seems, has pulled away towards high-Gini competitive individualism, undoubtedly buoyed by the success of Ikea, H&M and a dozen supercool indie-folk and fashion-electro bands); could this be a reflection of the vaunted Scandinavian egalitarianism and/or the internalised repression of individualism of the Jante Law, or just of more homogeneous societies? Brynin found that the euphoria of first love can damage future relationships. "Remarkably, it seems that the secret to long-term happiness in a relationship is to skip a first relationship," said Brynin. "In an ideal world, you would wake up already in your second relationship." While researching the components of successful long-term partnerships, Brynin found intense first loves could set unrealistic benchmarks, against which we judge future relationships. "If you had a very passionate first relationship and allow that feeling to become your benchmark for a relationship dynamic, then it becomes inevitable that future, more adult partnerships will seem boring and a disappointment," he said. The fact it has survived so long - and not been eradicated by evolution - indicates it has helped the human race become stronger. "I have received e-mails from ex-sufferers saying in retrospect it probably did help them because they changed direction, a new career for example, and as a result they're more content day-to-day than before the depression." Aristotle believed depression to be of great value because of the insights it could bring. There is also an increased empathy in people who have or have had depression, he says, because they become more attuned to other people's suffering. According to de Vries, the super-rich are increasingly succumbing to what has been labelled Wealth Fatigue Syndrome (WFS). When money is available in near-limitless quantities, the victim sinks into a kind of inertia. "The rich are never happy, no matter what they have," he told CNN. "There was this man who owned a 100ft yacht. I said: 'This is a terrific boat.' He said: 'Look down the harbour.' We looked down the marina, and there were boats two and three times as large. He said: 'My 100ft yacht today is like a dinghy compared to these other boats.' When else in history has someone been able to call a 100ft yacht a dinghy?" Some of our friends have jumped from nice five-bedroom houses in South Kensington to gated mansions in St John's Wood, complete with hot and cold running staff. But many who join the super-rich find it hard to keep their old circles of support. Happiness studies have repeatedly shown that being marginally better off than your neighbours makes you feel good, but being a hundred times richer makes you feel worse. So either you change your friends or live with the envy of others. The article goes on to expound numerous other causes of wealth-induced misery: social support networks break down, as relationships with old friends are strained by the wealth disparity and poisoned by real or perceived envy; and all the cars, yachts and new houses your money can buy you just become boring much more quickly. (It's the hedonic treadmill effect, where one becomes acclimatised to one's level of comfort and contentment, it takes even more to not succumb to ennui.) Meanwhile, the wives of the super-rich (and most of the super-rich are men; presumably husbands of super-rich women or gay partners would suffer the same) suffer the same psychological consequences as the unemployed (that is, when they're not traded in for younger, prettier models), and their children, shuttled between nannies and estates, often end up clinically depressed. The happiest nations, he says, are those where people feel most equal, even if that means being less wealthy. Pentecost, a tiny island in the South Pacific, has recently been voted the happiest place on earth. They don't have WFS – in fact, they don't have money; they use pigs' horns instead. In places such as Pentecost, people actually talk to each other – indeed, belonging to a community is one of the single most important prerequisites for happiness. The team, which consists of a psychologist, a psychotherapist, two "workplace specialists", a "social entrepreneur" and "Richard Reeves, whose expertise spans philosophy, public policy and economics", has been given the task of increasing the levels of happiness in Slough, a town whose name has stood as a byword for post-industrial alienation and the dehumanising effects of modernity since John Betjeman penned his famous ode to the place in 1937. The Economist said: "Ireland wins because it successfully combines the most desirable elements of the new, such as low unemployment and political liberties, with the preservation of certain cosy elements of the old, such as stable family and community life." The researchers said although the UK achieved high income per head, it had high levels of social and family breakdown. At the very bottom of the list is Zimbabwe; I'm guessing North Korea and Iraq weren't included. Mice without the TREK-1 gene ('knock-out' mice) were created and bred in collaboration with Dr. Michel Lazdunski, co-author of the research, in his laboratory at the University of Nice, France. "These 'knock-out' mice were then tested using separate behavioral, electrophysiological and biochemical measures known to gauge 'depression' in animals," says Dr. Debonnel. "The results really surprised us; our 'knock-out' mice acted as if they had been treated with antidepressants for at least three weeks." 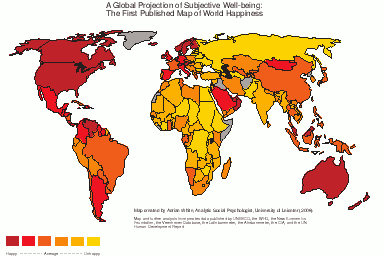 A study at the University of Leicester has produced a global map of happiness, by country. According to the study's methodology, the happiest countries on Earth are, in descending order, Denmark, Switzerland, Austria, Iceland and The Bahamas. (I would have thought that Nordic countries such as Iceland would have been penalised by the long winter nights and incidence of Seasonal Affective Disorder; perhaps the spectacular landscapes and general coolness makes up for that.) The USA is 23rd ("We're #23! "), and the UK is #41; meanwhile, various Japanophiles will be disappointed to find that Japan scrapes in at #90, being slightly sadder than the median. The least happy places surveyed are Zimbabwe and Burundi. Looking at the map, which is shaded according to colour, certain patterns emerge. Scandinavia and Finland are the same sanguine shade of red as Iceland and the US; Ireland is happier than the UK, and France and Portugal are the least happy countries in western Europe. Meanwhile, Australia and New Zealand are both in the top shade of happiness, as is Bhutan; Africa is generally a deeply unhappy place and Russia is quite gloomy. Not surprisingly, no data exists for Iraq, Afghanistan, Liberia, Somalia or North Korea, though one can guess that they're probably not brimming with joy. In another experiment, students who'd just come back from their break were polled. The ones who'd partied it up regretted their actions -- while those who studied were virtuously smug. But when asked to recall the spring break from the previous year, suddenly more students regretted their choice not to party. When alumni were asked to recall their spring breaks of 40 years ago, the results were even starker: Those who hadn't been doing beer shots out of a barber's chair were striken with remorse. Whereas guilt is an acute, hot emotion, missing out is a colder, contemplative feeling. Therefore, indulgence guilt is expected to predominate in the temporal proximity of the relevant self-control choice, but subsequently diminish over time. Now there's a conclusion that will deeply freak out social conservatives. The study was done in America in 2006; I wonder whether a similar study done in a culture (say, Japan) with a stronger sense of duty would yield different results. My research with Tim Wilson shows that when people try to simulate future events -- and to simulate their emotional reactions to those events -- they make systematic errors. Modern people take the ability to imagine the future for granted, but it turns out that this is one of our species' most recently acquired abilities -- no more than three million years old. The part of our brain that enables us to simulate the future is one of nature's newest inventions, so it isn't surprising that when we try to use this new ability to imagine our futures, we make some rookie errors. The main error, of course, is that we vastly overestimate the hedonic consequences of any event. Neither positive nor negative events hit us as hard or for as long as we anticipate. We're all told that variety is the spice of life. But variety is not just over-rated, it may actually have a cost. Research shows that people do tend to seek more variety than they should. We all think we should try a different doughnut every time we go to the shop, but the fact is that people are measurably happier when they have their favorite on every visit -- provided the visits are sufficiently separated in time. Those last four words are the important ones. If you had to eat 4 donuts in rapid succession, variety would indeed spice up your experience and you'd be wise to seek it. But if you had to eat 4 donuts on 4 separate Mondays, variety would lower your overall enjoyment. The human brain has tremendous difficulty reasoning about time, and thus we tend to seek variety whether the doughnuts are separated by minutes or months. Even in a technologically sophisticated society, some people retain the romantic notion that human unhappiness results from the loss of our primal innocence. I think that's nonsense. Every generation has the illusion that things were easier and better in a simpler past, but the fact is that things are easier and better today than at any time in human history. Our primal innocence is what keeps us whacking each other over the head with sticks, and it is not what allows us to paint a Mona Lisa or design a space shuttle. It gives rise to obesity and global warming, not Miles Davis or the Magna Carta. If human kind flourishes rather than flounders over the next thousand years, it will be because we embraced learning and reason, and not because we surrendered to some fantasy about returning to an ancient Eden that never really was. In the first of several speeches on families and community, Mr Cameron told a conference organised by Google: "It's time we admitted that there's more to life than money, and it's time we focused not just on GDP but on GWB - General Wellbeing. "It's about the beauty of our surroundings, the quality of our culture and above all the strength of our relationships. There is a deep satisfaction which comes from belonging to someone and to some place. There comes a point when you can't keep on choosing; you have to commit." Mr Cameron's speech, seen as an attempt both to distance the party from its Thatcherite past and to underline its portrayal of the chancellor as obsessed with work and regulation, said Britain should "move beyond a belief in the Protestant work ethic alone". But he added that regulation could make business less competitive and that the key was to educate companies and encourage good practice. Of course, promises are cheap, and policies are another thing. Whether, when push comes to shove, the Tories would translate all their happy talk of leisure and work-life balance into concrete policies that might adversely affect profits (such as, for example, ending Britain's opting out from the European working time directive, which would limit work week lengths, averaged over a period, to an indolently un-Anglo-Saxon 48 hours), or just borrow New Labour's trick of frantically spinning in one direction whilst legislating in the opposite, is another matter. Happiness also has little to tell us about some of the most difficult issues of our times. Because it places a particular vision of the good life above procedural fairness, it is largely silent on human rights and constitutional government. It struggles to tell us anything useful about what morally to value in life and has little to say about the red-green agenda of marrying ecological sustainability and social justice concerns. Happiness is therefore a flexible friend for the political right. It can provide a veneer of radicalism to a project that eschews difficult trade offs and policy choices. In the wrong hands, it appeals to a stressed out, downshifting middle class but speaks less to those suffering the misery of poverty. For instance, a topic that is often talked about in relation to happiness is love. In fact, looking up the ANEW list of words, love ranks the third out of 1034 words, with a high 87.2 pleasure factor. Instead, the word love in our list is neutral, with a happiness factor of only 48.7. Moreover, a morphological variation of the same word, loved, is ranked similarly high in the ANEW list (86.4), but it is marked as a sad word in our list (28.1). The only happy variation of this word is lovely, which has a happiness factor of 77.3 (this word does not appear in the ANEW list). What these rankings suggest is that the stereotypical view of love (the public view) is that of a happy word (the ANEW ranking), but the more private view of this word is neutral, due to a balanced distribution of this concept in both happy and sad moments. There are also several examples of words in our list that have a high happiness factor, and yet they are not even listed in the ANEW list of words. For instance, shopping (79.5) and bought (69.9), are two of the highly ranked words in our list. Similarly, food related events (lunch (73.1), dinner (72.1) food (65.0), drink (64.4), etc.) have a high happiness factor, with only two of these concepts (dinner and food) being mentioned in the ANEW list. Another interesting example that has a positive happiness load in our list is drunk (59.1), which is most likely not one of the most widely publicly admitted states of happiness. The study also charted the occurrence of happiness by time of day and week (finding that happiness is at a low at around 8am, as people are wrenched from their blissful sleep to face the drudgery of the world), and peaks at 2-4am (presumably because of the nocturnal habits of LiveJournallers); on a weekly chart, happiness peaks on Saturday and then dives, reaching a low on Wednesday before climbing back for the weekend. Which shows that anticipation plays a big part in one's immediate happiness. A large fraction of the bigrams with low happiness factor are centered around humans, i.e. miss you, I hate, I wish, for him, you were, etc. An observation in the same vein can be drawn from the ranking of three-grams, where facts revolving around love are related to humans in the top sad three-grams, I love him (37.33), I love you (37.09), but refer to objects in the three-grams with high happiness factor: I love it (85.00), I love the (82.85), I love that (68.62). This reinforces the findings from the previous section, which showed that expressions of sad feelings are more often human-centered than the happy feelings. Go shop for something new — something cool, make sure that you love it. Then have lots of food, for dinner preferably, as the times of breakfast and lunch are to be avoided. Consider also including a new, hot taste, and one of your favorite drinks. Then go to an interesting place, it could be a movie, a concert, a party, or any other social place. Having fun, and optionally getting drunk, is also part of the recipe. Note that you should avoid any unnecessary actions, as they can occasionally trigger feelings of unhappiness. Ideally the recipe should be served on a Saturday, for maximum happiness effect. If all this happens on your birthday, even better. "Every time a person is forced to repress his true feelings there are negative consequences for his health," said Professor Dieter Zapf, a researcher into human emotions. The study tested students working in an imaginary call centre who were subject to abuse from clients. Some of the participants were allowed to answer back, while others had to be polite and friendly all the time. Those who stood up to clients had a rapid heartbeat for a brief period, but for those who had to remain friendly their heart was still racing long after the client had hung up. The new study followed almost 1500 Australians, initially aged over 70. Those who at the start reported regular close personal or phone contact with five or more friends were 22% less likely to die in the next decade than those who had reported fewer, more-distant friends. But the presence or absence of close ties with children or other relatives had no impact on survival. Which all flies in the face of conventional wisdom, that supportive, tightly-knit families are the key to health and happiness. Though the explanation for this could be that it is not so much a truth as a manifestation of an evolved cultural response to the environment, a mantra of family-values repeatedly recited to counterbalance the ambient irritation of interaction with family members and reinforce stable social structures. One interesting hypothesis, though, is that happy people have an ''everything is fine'' attitude that reduces the motivation for analytical thought. So they fall back on stereotypes -- including malicious ones. There is one bit of the world that happy people do see in an irrationally rosy light: themselves. As the British psychologist Richard P. Bentall has observed, ''There is consistent evidence that happy people overestimate their control over environmental events (often to the point of perceiving completely random events as subject to their will), give unrealistically positive evaluations of their own achievements, believe that others share their unrealistic opinions about themselves and show a general lack of evenhandedness when comparing themselves to others.'' Indeed, Bentall has proposed that happiness be classified as a psychiatric disorder. Over the last few decades, it is precisely the groups that have made the most social progress in the United States -- women and educated African-Americans -- that have reported declines in their level of happiness. On reflection, this is not surprising. As education and freedom increase, desires -- and unmet desires -- inevitably multiply; our well-feeling may decrease, even as life becomes fuller and more meaningful. In Eastern nations like China, where happiness as a goal is less highly rated, people report lower levels of life satisfaction, but they also have lower suicide rates. "Until recently, we shied away from killing insects, and yet now we Bhutanese are asked to watch people on TV blowing heads off with shotguns. Will we now be blowing each other's heads off?" The marijuana that flourishes like a weed in every Bhutanese hedgerow was only ever used to feed pigs before the advent of TV, but police have arrested hundreds for smoking it in recent years. Six employees of the Bank of Bhutan have been sentenced for siphoning off 2.4m ngultrums (£40,000). Six weeks before we arrived, 18 people were jailed after a gang of drunken boys broke into houses to steal foreign currency and a 21-inch television set. During the holy Bishwa Karma Puja celebrations, a man was stabbed in the stomach in a fight over alcohol. A middle-class Thimphu boy is serving a sentence after putting on a bandanna and shooting up the ceiling of a local bar with his dad's new gun. Police can barely control the fights at the new hip-hop night on Saturdays. Psychologists* claim to have found the formula for happiness. Happiness is, apparently, equal to P+(5E)+(3H), where P stands for "Personal Characteristics", E for "Existence" and H for "higher-order needs". I was almost expecting a 42 in there somewhere. * or at least a "life coach", whatever that is; I suspect it means some sort of Tony Robbins-like guru type. Connect 'Em Till They Bleed: A new study shows that unhappy workers are more productive, not being distracted by unprofitable pursuits such as happiness, and/or seeking to lose themselves in diligent work. Perhaps this will spawn a new school of management methodology designed to keep one's employees profitably miserable? Life is unfair, kill yourself or get over it: According to a recent survey, Britain is a dismal place, with 1/3 of the population feeling "downright miserable", 1/4 believing that life is unfair, and one in 10 believing that they would be better off dead. Then again, is that really saying anything that numerous British indie bands haven't already said in many ways? Instead of learning to long for the indulgences of the outside world, most Bhutanese reacted with pride after TV arrived, he said. Until they saw the violence and lawlessness in the world outside, ``we didn't know how well off we were,'' Thinley said.